Usage of sensors in the Test & Measurement market are on the rise. According to analysis from Frost & Sullivan the market will increase by more than 28% by the year 2020. 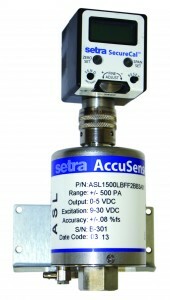 Setra Systems, Inc. is poised to meet this demand with our line of Highly Accurate and High Performing product lines. Our AccuSense platform provides industry leading overpressure capability, linearity, and performance over a wide temperature range. From range and accuracy to media compatibility for your performance Test Stands, Leak detection and Tank Level equipment, and most of your Test & Measurement needs, Setra has the products for the most demanding applications.